The issues listed below reflect the issues caused by the most recent product updates. For more troubleshooting help, see Troubleshoot problems with Skype for Business. Launching Skype for Business using Version 1707 (Build 8326.xxxx) in Windows 10 results to an error or a blank window and does not show the log-in screen. This issue is now fixed in Version 1707 (Build 8326.2070), currently available to Insiders and will soon be available to all subscribers in the next day or so. If you're an Office Insider, to get the update immediately, open any Office 2016 app and choose File > Account > Update Options > Update. Thanks very much for your patience as we work through the fix for Skype for Business. 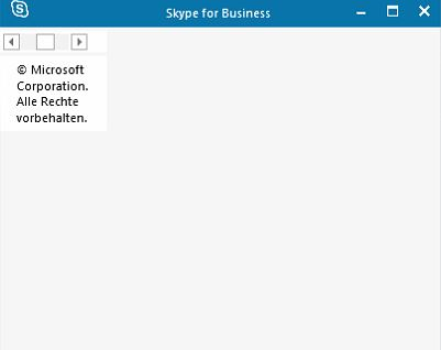 Instant messages sent between Skype Business for Windows Desktop and Skype for Business on mobile devices or Lync Web App. Chat notifications with Chinese (or other non-unicode) text. Saved conversation history with Chinese (or other non-unicode) text. Copy and paste from Skype to Word or Outlook Mail message with non-unicode text except when pasting as "keep text only". This issue is now fixed in Version 1707 (Build 8362.2062) or later, which started rolling out to production customers on July 31, 2017. To get the update immediately, open any Office 2016 app and choose File > Account > Update Options > Update. Connect with experts, discuss the latest Skype for Business news, updates, and best practices, and read our blog. Ask a question and find solutions from Office Support Agents, MVPs, Engineers, and other Skype for Business users. We love reading your suggestions and feedback about how you use our products! Share your thoughts. We're listening.